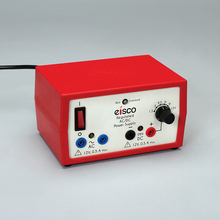 The 12-V Eisco® AC/DC Power Supply (regulated) offers both AC and DC power up to 0.5 A. The outputs are completely independent of each other and can be loaded simultaneously. This compact entry-level power supply is ideal for low current experiments common to beginner circuits and physics experiments. The 12-V Eisco® AC/DC Power Supply (regulated) offers both AC and DC power up to 0.5 A. The outputs are completely independent of each other and can be loaded simultaneously. This compact entry-level power supply is ideal for low current experiments common to beginner circuits and physics experiments. The unit makes each output easily selectable with the assistance of a black knob on the right side of the front panel. The power supply also has DC overload/short circuit protection and features an overload indicator light. CSA approved, CE marked. Testing of grounding, high voltage insulation test, burn test, and leakage test was performed.